Baseball is a team sport played on a special field over the course of several periods of play, called innings. Each inning is further divided into two parts, the top and the bottom, during which one team tries to score points while the other team defends the field. Points are scored by hitting a thrown ball (the baseball) with a bat, and then running around part of the field and returning to the start position. If the runner is tagged with the baseball by the defensive team before completing the run, the runner is out. After three outs, the inning moves forward and the teams switch places. College and professional baseball games are played over nine innings. Less intense levels of competition usually feature six or seven.The entire defensive team is always on the field. Offensive players try to hit the ball one at a time, so to start with theres only one offensive player on the field. As play progresses, up to four offensive players may end up on the field, but only one batter is up at any given time. The other three players are simply waiting in safe spots to complete their runs and score points.There are three safe spots for runners, one at each corner of the running area, called bases. 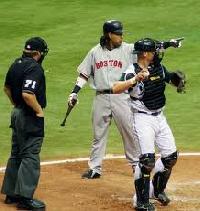 The bases must be visited in order to score a point; a runner can also choose to stop on a base and wait until the next play to continue running to the next. Bases are explained in greater detail below. The baseball field (sometimes called the baseball diamond) is a specially designed field composed of two basic parts the infield and the outfield. The infield is the center of action. Its defined by four rugged pads set in the ground, called bases, at equal points from each other, forming a square diamond shape. The path from each base to the next is made of dirt, rather than grass. Inside the diamond is a grassy area, and near the middle of that is a low dirt mound with another plate on it called the pitchers mound.he batter (offensive player) stands at one base, called home plate, and waits for the ball to be pitched from the pitchers mound so he or she can try to hit it with the bat. There is a painted rectangle on either side of home plate called a batters box that defines where batters are allowed to stand. Another painted box behind home plate defines where the catcher crouches to catch the ball if the batter misses it. While the other bases are four sided and typically made of canvas, home plate is five sided and made of rubber, to distinguish it. There is also usually a tall fence cupped around home plate to prevent stray balls from hitting the audience behind. Bases are numbered counterclockwise from home plate first, second, and third. Second base is on a direct line from home plate through the pitchers mound. A baseball thats hit and lands to the left of third base or the right of first base (as seen from home plate) is considered a foul ball, which invalidates the play. Foul lines are usually painted on the field to show where the border is. There are regulation distances that define a proper baseball infield. Each base is 90 feet (27.4 m) apart from the next. The pitchers mound is 60.5 feet (18.4 m) from home plate. Past the dirt border that defines the infield is a large swath of green turf called the outfield. The foul lines continue on through the outfield, but otherwise, the space is open and undefined by structures or lines. There are a few defensive players in the outfield the left, center, and right fielders who try to catch and or return long distance hits. The outfield bulges out in the center, behind second base. The outer edge of the field is called the fence.Unlike the infield, theres no strict rule regarding the size of a baseball outfield. American professional baseball fields have home plate to center field fence distances ranging from 390 feet (118.9 m) to 435 feet (132.6 m). The pitcher pitches the baseball towards the batter. The ball has to be pitched at a certain level and straight over home plate to be considered fair, but a good pitcher can still make it very tricky to hit. The catcher crouches behind home plate with heavy protective gear and a special mitt, and catches the ball when the batter doesnt hit it. The catcher can also pick up and throw a ball in play, if it lands close by. The first baseman guards first base. He or she must be very good at catching the ball; if the first baseman manages to get a hold of the ball before the batter has made it to first base, its almost impossible for the batter to avoid being tagged out. The second baseman guards the area between first and second base. In addition to tagging runners out at second base, the second baseman also helps catch ground balls before they roll into the outfield. The shortstop stands between second and third base and returns balls to any of the basemen to help get an out. Shortstops see a lot of action in a typical game more than any other defensive position as most right handed batters tend to send the ball into the shortstops area. The third baseman closely guards third base, and must also have an exceptionally strong throwing arm to send balls quickly to first base, all the way across the diamond. This is because (as with the shortstop) many right handed batters send the ball straight towards third base when they hit it. The outfielders are three players who guard a different section of the outfield left, center, and right, as previously described. Their job is to catch high and long balls and prevent the batting team from scoring easy runs by simply hitting the ball hard. All defensive players are allowed to use a large leather mitt on one hand to help them catch the ball. The catchers mitt is even bigger and thicker. Only offensive team members can get an out. Once a player is out, he or she is removed from play, and from the batting rotation, for the rest of the inning. Once three players are out, the defensive and offensive teams switch. There are several ways to get an out. The commonly seen ones are described below. If a defensive player catches the batters ball before it hits the ground, the batter is automatically out no matter what else is happening, and even if the ball was caught in foul territory. This is called a flyout. If a defensive player touches a runner with the ball (or a glove holding the ball) while the runner isnt standing on a base, the runner is out. The ball must be held in the defensive players hand; beaning the runner with a throw is unacceptable. This is called a tag out. If a batter passes on a chance to hit a fair ball (one that wasnt too high, low, or close to the batters body), or if a batter swings and misses, he is given a strike. Three strikes result in an out, called a strikeout. On first base only, if a fielder touches the base while holding the ball before the runner can reach it, he or she is out. This is called a ground out. If a runner is standing on a base and has to run forward to make room for the next runner (as only one runner can be on a base at a given time), he or she can receive a force out if a fielder at the next base touches the base while holding the ball. A strike is an indication that the batter either could have swung at the ball and didnt, or swung at the ball and missed. Foul balls can result in strikes as well. After three strikes, the batter is out and the next batter steps up to the plate (until three outs are reached). A ball happens when the pitcher pitches a ball thats too far outside the hitting area to be considered hittable by the batter. After four balls, the batter walks, which is a free advancement to first base. Batters will occasionally try to crowd the plate and earn a walk rather than hit the ball. A fair ball is a ball that the batter hits which lands between the foul lines, allowing the batter to run for first base. A fair ball is what most batters want, most of the time. A foul ball is a ball that the batter hits which lands outside the foul lines. Unless its caught and turned into a flyout, a foul ball just counts as a strike; however, in most cases, players cant get more than two strikes as the result of hitting a foul ball. Additional foul balls arent counted. Each defensive player takes a position on the field. The shortstop, second baseman, and outfielders stand in the middle of their areas. The rest of the players stand on specific spots pitcher on the mound, first and third basemen on their bases, catcher behind home plate. The batter stands in either the left (right handed) or right (left handed) batting box on one side of home plate. The umpire briefly checks to verify that everyone is in the proper position, then shouts play ball to begin the game. The pitcher will attempt to throw balls that are difficult to hit, while still remaining inside the strike zone where the batter is expected to try to hit them. 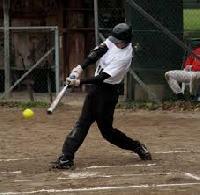 The batter does his or her best to quickly judge whether or not the ball is safe to hit, and then swings at it. If the batter connects and the ball doesnt cross the foul lines, its in play.Pitchers often use fastballs, curveballs, changeups, and sliders to confound batters. The fastball is what it sounds like very fast as is the curveball. A changeup involves the pitcher pretending to throw a fastball but actually throwing a much slower pitch, confusing the batters sense of timing. A slider is a difficult to throw ball that combines most of a fastballs speed with a curveballs lateral movement. While the ball is moving across the field, either through the air or along the ground, the batter (who is now called the runner or baserunner) drops the bat and runs as fast as possible towards first base. As long as the runner doesnt get a flyout, tag out, or ground out, he or she can stop at first base, or keep going until its no longer safe. In the meantime, the fielders work to collect the ball and return it to the runners position to get him or her out. Fielders are allowed to throw the ball to each other or run with the ball in order to get it close enough to the runner to get an out. Runners arent allowed to touch the ball on their own. A runner who isnt in danger of being forced or grounded out can sometimes avoid being tagged out at a base by sliding underneath the baseman and trying to touch the base before the ball touches him or her. As long as even one fingertip or toe is touching the base before the runner is tagged, he or she is safe.